Providing a range of specialist products and services to public and private healthcare organisations in the UK and internationally, Kalamazoo Direct is trusted to help healthcare providers ensure the safety and well-being of their patients, staff and visitors. As part of our Healthcare Solutions, we provide a range of cost-effective patient care, ID & visitor management, hospital ward and bespoke print solutions. Designed to help fight against superbugs such as MRSA, PVL and MHRA, our TouchSafe™ products include Bed End Units and Carenote Systems. Safe to use in any hospital or healthcare facility, the TouchSafe™ additive has no side effects and is non-toxic. Approved by the EPA, FDA and EU biocide directive, TouchSafe™ has been independently tested and verified by the University of Milan, the University of Catania, the SIK institute in Gothenburg and Law Labs in Birmingham, UK. TouchSafe™ products have an integrated additive containing silver ions, which kill microbes on contact. 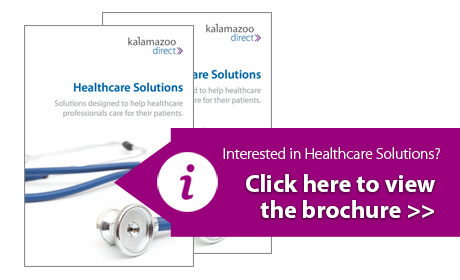 Kalamazoo Direct is a leading provider of identification and visitor management solutions suitable for use in the healthcare sector. Our systems help to promote a safe and secure environment for all patients, staff and visitors and we provide a range of solutions and accessories to suit all budgets and requirements.